Mr Brown with nursery children. 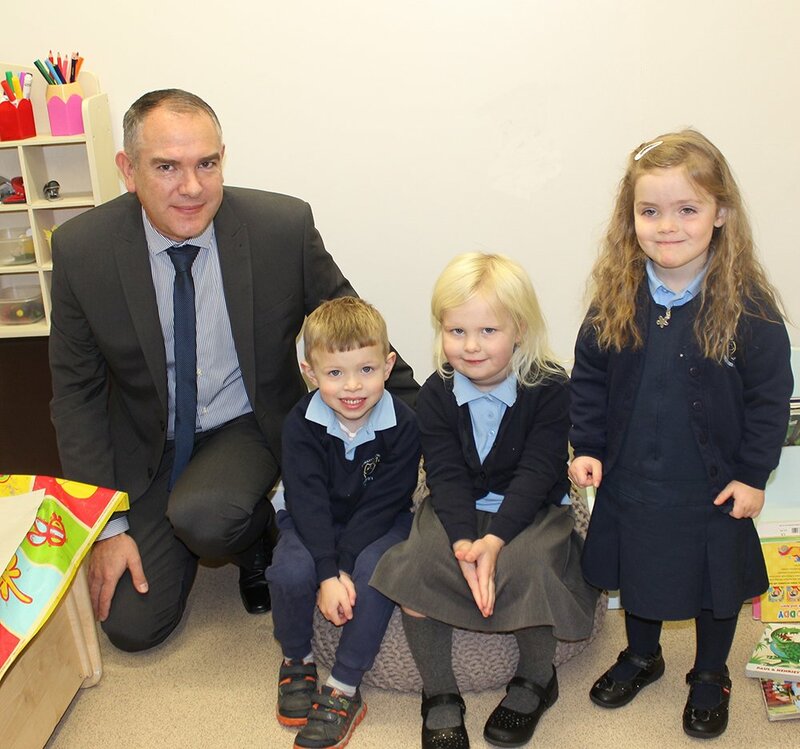 St Mary’s Catholic Primary School in Brewood, the top performing primary school in Staffordshire, is celebrating the opening of its brand new nursery classroom. The nursery was officially opened by Mr Karl Brown, Principal at Blessed William Howard Catholic High School in Stafford (BWH). The informal ceremony was attended by prospective parents, school governors and local dignitaries from Brewood Parish Council. As well as presentation on life at St Mary’s, the morning also featured musical performances from BWH students who used to attend St Mary’s Catholic Primary School. Both schools are members of the Painsley Catholic Academy. St Mary’s has provided a nursery for the local community for the past two years, but it has always operated in a separate building – the old school house – which belonged to the Parish. Mrs Bernadette Corbett decided it would benefit the nursery children and the whole school if they were relocated into the main school building. The new space is attached to the main school and offers a much more versatile environment, as it allows the children a more free-flow experience to outdoor learning throughout the day. The children also have direct access to the main school hall and other facilities allowing them to be fully integrated members of the school family. St Mary’s Nursery can now take up to 15 children a day from 2-4 years of age, in a modern environment designed specifically to meet the children’s learning needs in a stimulating and safe way. The building fully complies with the expectations of the Early Years Foundation Stage giving the children stability and consistency.